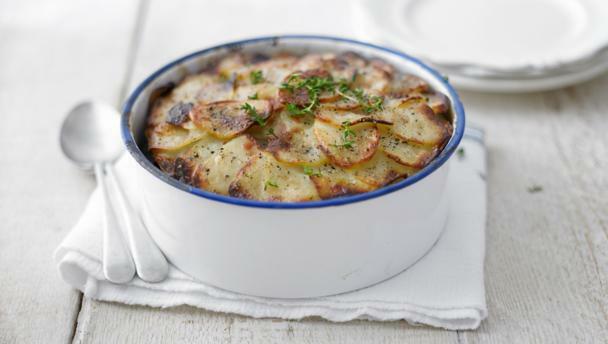 With the evenings drawn in and a chill in the air what could be more warming than a Lancashire hotpot from The Hairy Bikers’ Food Tour of Britain? Heat the olive oil in a pan and fry the lamb pieces and kidneys for 1-2 minutes on both sides, or until golden-brown all over. Remove from the pan and set aside. In the same pan, cook the onions and salt for 2-3 minutes, or until the onions have softened. Stir in the flour until the onions are well coated with the flour. Add the stock to the pan along with the thyme, bay leaves and Worcestershire sauce. Stir and simmer for 8-10 minutes, or until thickened slightly. Butter a lidded flame-proof casserole dish and place a layer of potatoes (about a third) over the bottom of the dish and season with salt and freshly ground black pepper. Spoon in half of the browned lamb and lambs' kidneys, then lay over half of the black pudding slices and pour over half of the thickened stock mixture. Repeat the layering process until all of the potatoes, lamb pieces and kidneys, black pudding and stock have been used, finishing with a layer of potatoes on top. Dot the potatoes with the butter, then cover with a lid. Place the casserole into the oven to cook for 20 minutes, then remove the lid and cook for a further 20 minutes, or until the potatoes are golden-brown on top. To serve, spoon into serving bowls.